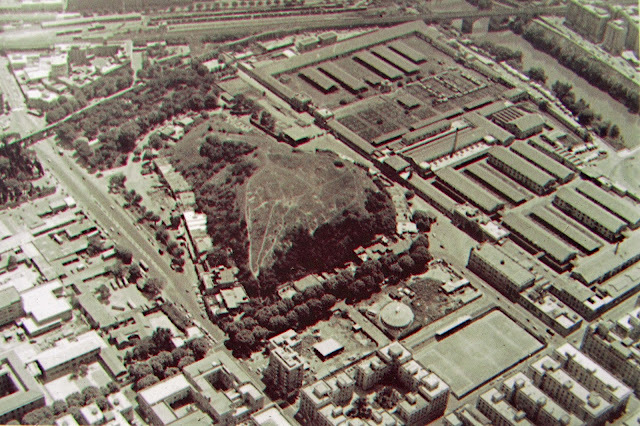 At first glance Monte Testaccio seems just like any other overgrown hill on the outskirts of Rome. However, it is anything but ordinary. This amazing site is actually made up entirely out of Roman amphorae, specifically olive jars. It is truly enormous, with a circumference of nearly a kilometre at its base and a height of over 35m (another 15m is located below the current street level). It has been estimated that the hill contains the remains of as many as 53 million olive oil amphorae, in which some 6 billion litres of oil were imported. This huge mound of rubbish is located just a short distance from the eastern bank of the River Tiber, near the Horrea Galbae where the state-controlled reserve of olive oil was stored in the late 2nd century AD. 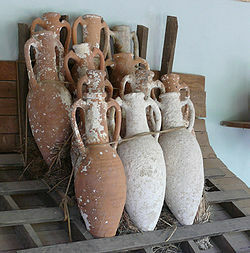 Unlike other amphorae the olive jars could not be recycled after they went out of use. They were too impregnated with oil, which made them a dirty, smelly waste product that needed careful disposal. 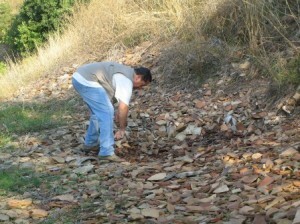 To deal with this problem the Roman officials specifically designated Monte Testaccio as the cities dump for olive jars. Indeed, as an archaeological dig carried out in the early nineties has shown, it was a highly organised refuse site. The excavation revealed that the mound had been raised on a series of terraces with retaining walls made of nearly intact jars filled with sherds to keep them in place. The remaining amphorae were probably carried up the mound intact and then broken up on the spot, with the sherds laid out in a compact and stable pattern. Lime was then spread over the broken jars to neutralise the smell of rotting oil. 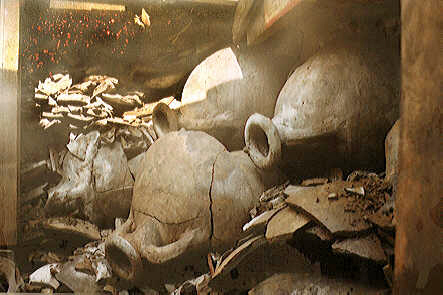 The amphorae were mainly large globular vessels that could hold 70 litres of oil. They often contained stamps in black and red pigment known as tituli picti, which gave information such as the weight of the oil contained in the vessel, the names of the people who weighed the oil and the name of the district where the oil was originally bottled. The stamps indicate that the majority of amphorae were imported from southern Spain with smaller quantities also coming from Libya and Tunisia. Most of the jars examined dated from c. 140-250 AD, but it is possible that the earliest layers in the mound date back much earlier, possibly to the first century BC. 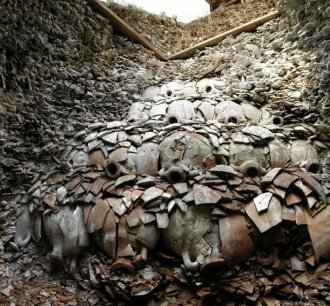 The sheer numbers of broken amphorae at Monte Testaccio indicate the huge amount of olive oil that was used each day by the inhabitants of ancient Rome, which after all, was then the largest city in the world with a population of 1 million people. It also gives us an insight into the long distance trade routes which spanned the Empire and the sophisticated waste disposal systems employed by city’s authorities. 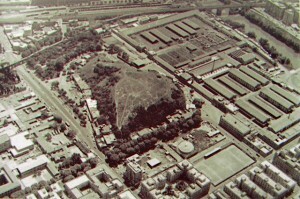 Monte Testaccio, a remarkable archaeological site. Hello, interesting website! I’m an enthusiast of medieval and prehistoric monuments and sites and I found very good articles in your pages. What I’d like to say to you is that Testaccio is spelled with only one S. It’s a district of the city of Rome and its name in Italian can sound almost like a “big head” (testa = head in Italian). Monte Testaccio is indeed very interesting. When we were there it was unfortunately closed (reservation to visit it is needed), but it is impressive to walk around it anyway. The university of Barcelona has made several studies on Monte Testaccio, for the reason that most amphorae were made in Southern Spain (in roman times: Baetica) almost at the place where the olive oil was obtained and shipped to Ostia and Rome. If you google ‘Ceipac’ you find the information of the university of Barcelona regarding Roman amphorae. They have an interesting database of stamps, but you have to ask permission for access. There is a lot of other information too.